Throughout the past two centuries, the Great Lakes region has witnessed a variety of non-native (exotic) species infiltrate its boundaries. These species more often than not remain unnoticed and cause very little harm to the habitat in which they reside. However these exotic species sometimes become established in a given ecosystem and begin to cause economic, human health, or environmental damage in that ecosystem. These species are termed invasive and can cause many negative impacts (US Environmental Protection Agency, 2009). 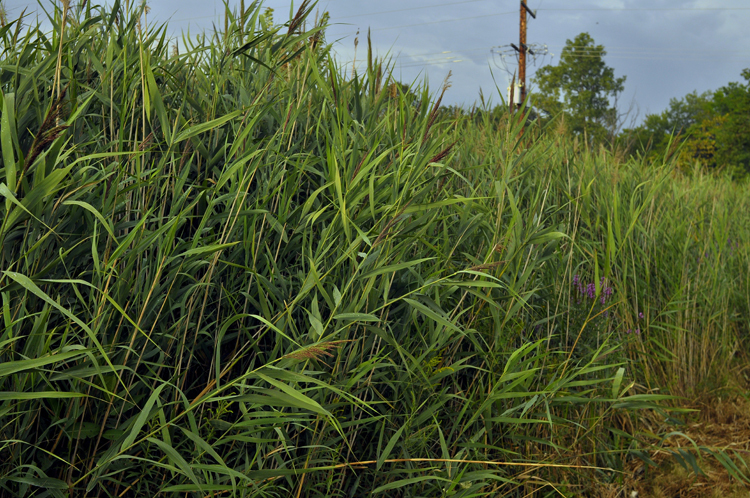 One species in particular, a fast-growing invasive reed, has begun to plague the Great Lakes region. Common reed, Phragmites australis, has recently been labeled an extreme threat to native ecosystems due to the plant’s aggressive ability to dominate a variety of ecosystems once introduced. Although a native species of Phragmites exists throughout the Great Lakes region, the invasive form is quickly displacing the native variety, as well as many other native types of vegetation. 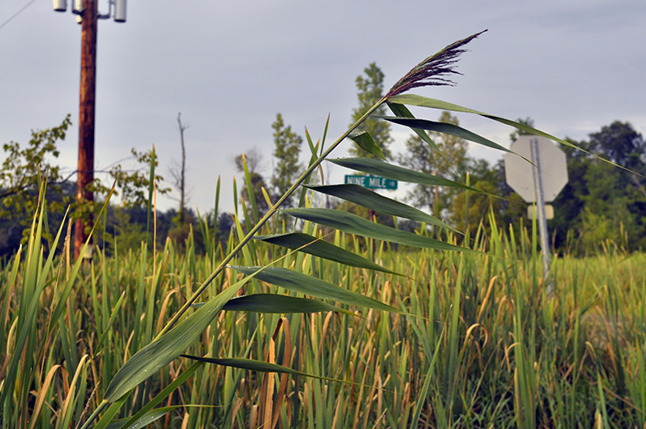 Invasive Phragmites is most prevalent in emergent wetlands throughout the Great Lakes region. This is due to rapid water level changes and the vast areas of exposed habitat located in emergent wetlands. Phragmites can become well established quickly because its dispersion occurs underground, by way of rhizomes. 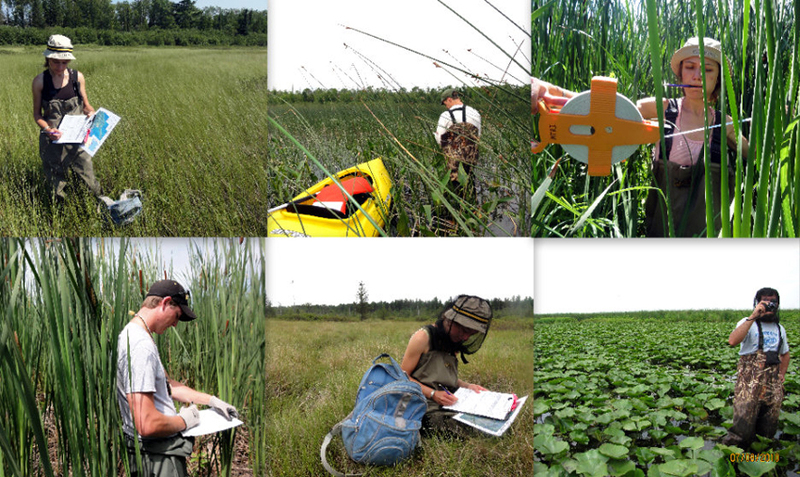 Within 10km of the Great Lakes coastline, over 300,000 acres of freshwater emergent wetlands exist. These areas, which are home to many endangered and threatened species, are at risk of being invaded by dense stands of Phragmites. Once established, Phragmites is difficult to control and requires repeated applications of herbicide followed by burning of the area. This regimen, however effective, also kills any native vegetation that remains after the initial invasion of Phragmites. Currently there is no comprehensive map or documentation of the status/extent of Phragmites infestation in the Great Lakes region. 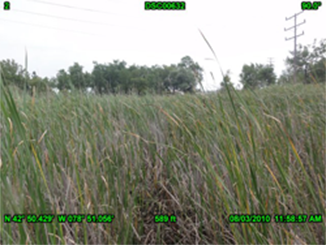 However, numerous environmental organizations are attempting to locate and record the location of Phragmites, but their surveys usually cover small areas of land. This project, developed and initially funded by the USGS Great Lakes Science Center, is focused on looking at Phragmites distribution and expansion throughout the Great Lakes basin. Recognizing MTRI’s expertise in satellite data analysis, and more specifically imaging radar analyis, USGS employed MTRI to cooperatively work on the mapping component of this project. The USFWS became involved to provide additional support. Using a combination of synthetic aperture radar (SAR) data and field documentation, known and potential Phragmites locations will be identified for the entire U.S. side of the Great Lakes basin (2011). SAR is an active system that interacts differently with vegetative ecosystems based upon biomass, structure and moisture characteristics. Since the biomass and structure of invasive Phragmites is so different from native, emergent wetlands, SAR can be used to detect and map it. SAR can also detect phonological changes in vegetation biomass and flood conditions which aid in wetland classification. PALSAR data spanning three seasons are being used for this broad-scale mapping project. For each basin, a spatial query was performed in order to generate random points. Using the National Wetlands Inventory (NWI) all emergent wetlands within the basin were identified using the mapping software program, ArcGIS. These emergent wetland areas were then merged with Great Lakes Coastal Wetlands data to gain geomorphology attributes (Albert et al. 2005). Using a NOAA Sampling Design Tool in ArcGIS, 75 random points were generated per basin. Field collection has occurred throughout the summer and fall (2010) and will continue through the summer season of this year (2011). So far, the four field teams have collected data on vegetation type, density, and height, as well as water condition measurements at over 600 locations throughout the basin. This field work is conducted by graduate and undergraduate students and the collected field measurements help to provide accurate identification of ecosystem types when classifying the PALSAR imagery. In addition to field documentation of Phragmites presence in the Great Lakes region, a database of other sources of field and GIS data showcasing Phragmites presence was created. This database, consisting of over 9,000 data locations, showcases field collected data from many local and state organizations including Ducks Unlimited, The Watershed Center Grand Traverse Bay, Michigan Department of Natural Resources and Environment, and the Great Lakes Indian Fish & Wildlife Commission as well as many others. Completion of the mapping portion of the project will result in the production of mosaicked maps of “potential Phragmites” for each lake basin. The goal is to complete this mapping for the entire Great Lakes basin by 2011, with further refinements of the maps in future years to obtain a final comprehensive map of Phragmites for the entire Great Lakes basin (circa 2008-10). USGS - Great Lakes Science Center will produce a distribution map that will be used by USGS to; 1) examine relationships between Phragmites and a suite of environmental variables; and 2) develop models that characterize potential Phragmites invasion and levels of shoreline vulnerability. This information will be incorporated into a decision support system and other online tools available to researchers, managers, decision makers, and the public. Albert, D.A., D. A. Wilcox, J.W. Ingram, and T.A. Thompson. 2005. Hydrogeomorphic classification for Great Lakes Coastal Wetlands. J. Great Lakes Res. 31(1):129-146. Join our list for web page updates and release of data products. Project funded through a cooperative agreement with USGS Great Lakes Science Center and US Fish and Wildlife Service National Wetlands Infrastructure as part of the Great Lakes Restoration Initiative (GLRI). Watch the "life in the field" video submitted to the American Geological Institute contest, winning third place - August 2010. 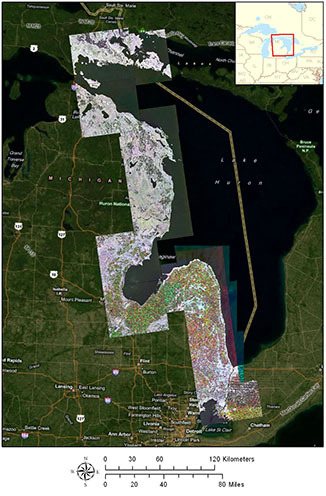 The GLRI Phragmites Decision Support Tool (DST) Mapper is now available. The DST Mapper is intended to provide resource managers with information to strategically develop effective Phragmites control and invasion prevention programs in the Great Lakes coastal zone. View maps that include Field Photos, Great Lakes Coastal Seasonal Mosaic, and Current Phragmites Distribution in the Great Lakes. More than 600 sites have photos. View the photos on Google Earth by Great Lakes basin. Below is an example of Lake Huron Seasonal Mosaic. 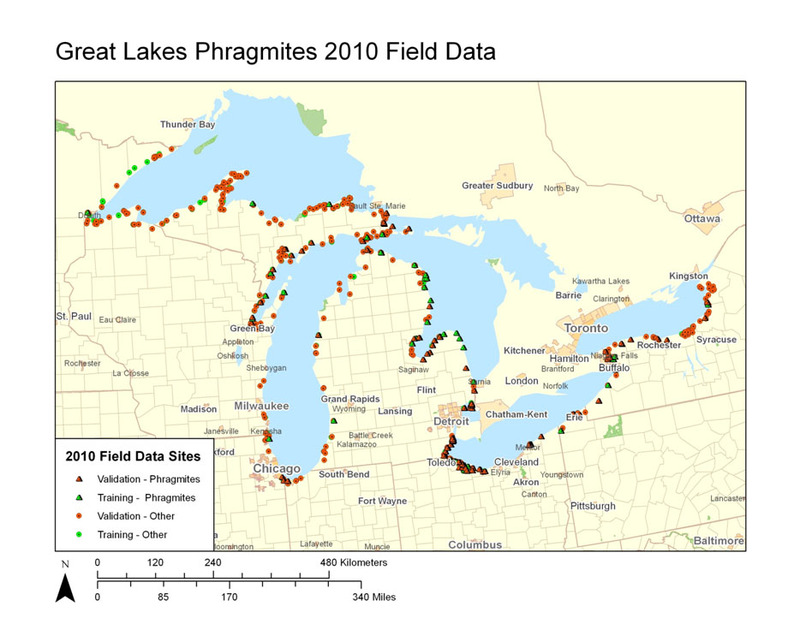 Below is an example of current documented distribution of Phragmites australis in the Great Lakes Region.